I’m prepping for a beach trip with a few other ladies and I thought I’d share this beautiful little pasta salad. It’s a dessert salad but there is no mayo or marshmallows or weird stuff like in Midwestern dessert salads. I mean, I like those salads, but this one seems healthier. And because of the no mayo thing it is safe to take to the beach or on a picnic. The recipe comes from me after piecing together what goes into a similar salad at the pasta salad stand at Roots Country Market in Manheim, PA. The proprietor lists the ingredients but obviously not the measurements so I improvised. What I like about this salad is its versatility; the basic ingredients are just categories and you can customize the salad to your taste. That’s it! Thaw the dessert topping if it is frozen. Cook the pasta and drain using a mesh strainer (you could use cheesecloth, too). Rinse with cold water until the pasta is cool. 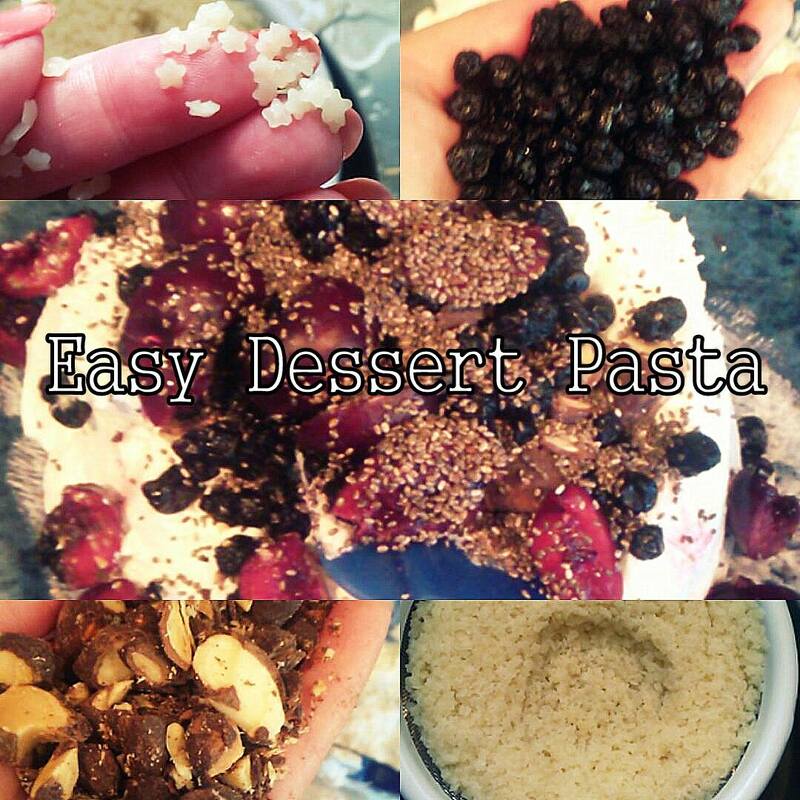 In a bowl, mix pasta, dessert topping, and fruit. 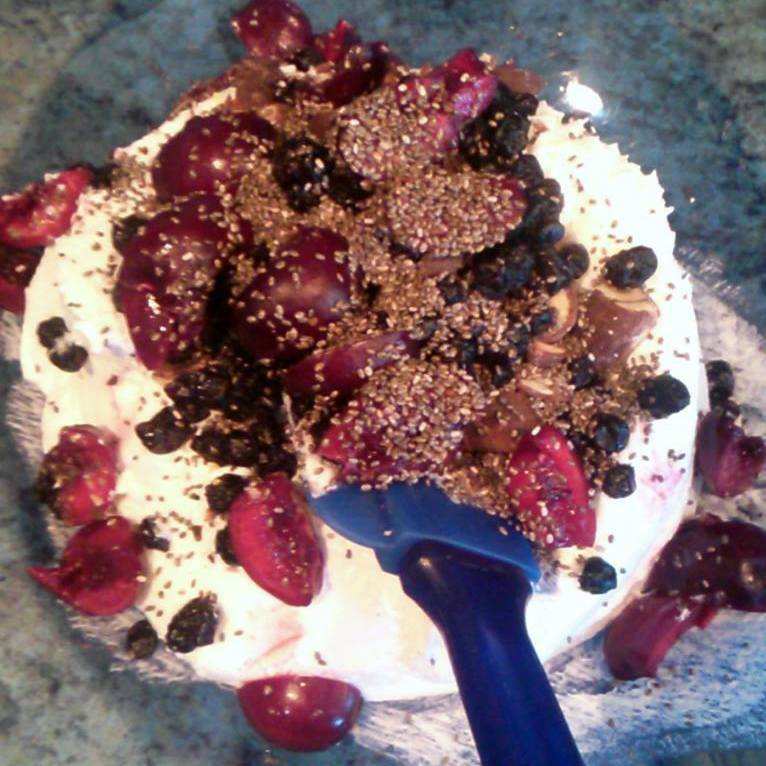 I used a package of sweetened dried blueberries, ½ c. fresh pitted and quartered cherries, and 1/2 c. cocoa almonds as well as a healthy sprinkle of chia seeds. I used this Pinterest trick to pit the cherries using a straw. Not bad for a small batch, though it I was doing a lot of cherries I’d want to use a real pitter. That’s it! Refrigerate and serve cold. Now, cross your fingers that I don’t get eaten by sharks out there! This entry was posted in Baking, beach, Creativity, Road Trips and tagged beach, desserts, recipes, sweets. Bookmark the permalink.